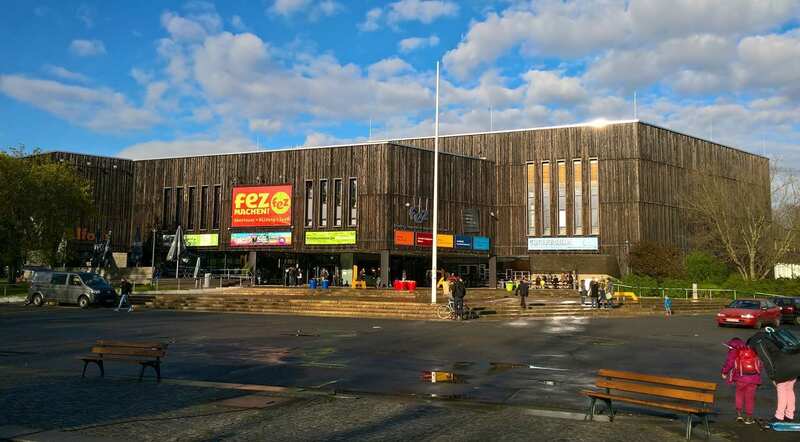 Superbooth gathered manufacturers and enthusiasts of synthesis machines into the weirdness of the FEZ-Berlin recreational centre for 3 days of intense electronic noise making. I was there for day 3 and here are the things I found most interesting. It’s impossible to cover everything so check out our rolling coverage of the show for most of the new releases. The big release of the show was undoubtedly from Novation. Although it wasn’t modular it was certainly crowd-pleasing. The Novation Peak is an 8-voice polyphonic tabletop synthesizer. It’s a hybrid of high-resolution digital oscillators and an immensely enjoyable analogue multi-mode filter. The layout is instantly familiar and easy to get around, the quality and feel of the knobs is excellent You come away feeling that they’ve done a really good job on this. There was a lot of sonic fun to be had on the front panel and there were some deeper options to be found in the screen’s menu system. I did find myself accidentally selecting other presets just by brushing the data knob which was annoying when you’d been working up a good sound. The price of GBP 1249 is a bit of a shock. In the world of the good value mini-synth and of course the budget conscious Behringer DeepMind 12 it’s a bit of a reality check for what a decent polysynth should probably cost. But there’s a heck of a lot of quality here that shouldn’t be undervalued. They also released the Mono Station which is like a photoshopped mock-up of a Bass Station II and Circuit – which is essentially what it is. It’s a 2 oscillator mono-synth, that’s actually paraphonic with a sequencer track for each oscillator and a 3rd for modulation. It has great physical controls over the synth and the 32 RGB velocity-sensitive pads of the Circuit. No drum section of course, and it’s analogue so you’re not going to be slicing in samples like you can on the Circuit. It’s more like a TB303 – it’s going to sit great in amongst a load of other gear. The quality of the build and controls is all good but it doesn’t feel as exciting or innovative as the Peak. And it looks just a little weird. Personally, if it also had the sound engine of Circuit built in then it would be completely amazing. 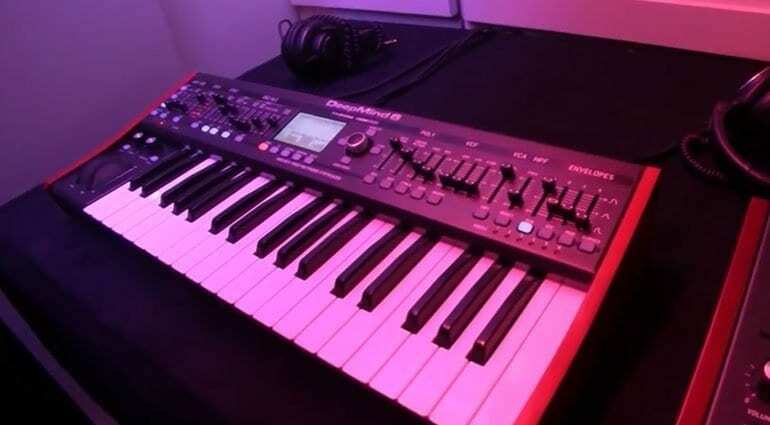 Behringer had promised to show us two new synths at Superbooth – and they sort of delivered. There was a desktop version of the DeepMind 12 which we had all been expecting and a 3-octave DeepMind 6 which we hadn’t. Both the desktop and the DM6 have the same sound engine as the DM12. The DM6 though has 6 voices and is missing the wi-fi. They had to slightly miniaturise the faders in order to fit it into the smaller form factor, but the size, shape and of course price ($699) of the DM6 is pretty compelling. What we had been hoping to see was the Model D clone of the of the Minimoog, and after the initial disappointment, it arrived unexpectedly in a box on the morning of day 2. The Midas guys on the stand hadn’t seen it before so this was everyone’s first go. Check out the video for some of the basic sounds. For $399 is sounds pretty good to me. Does it sound as good as a £3599 Minimoog? That’s not a question I can answer. What I can say is that it was small. They’ve designed it to fit in the Eurorack format, but in order to do that they’ve had to do some more selective miniaturisation. The knobs are pretty weeny and it makes a difference to the experience of using it – it feels compromised. And just down the corridor, you could try out the real thing and whether it sounds the same or not the physical experience of interacting with the instrument was very different. Is that important? Who can say? 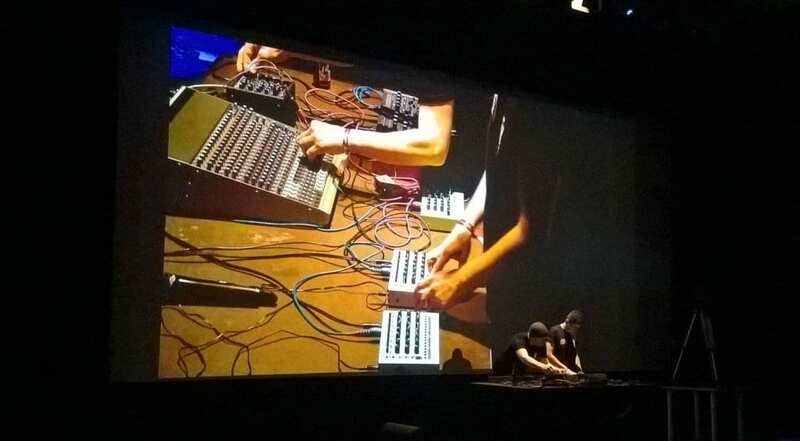 The rock stars of modular are undoubtedly Make Noise from North Carolina and Erica Synths from Latvia. Both seem to deal with the chaos of modular in deep and creative ways. 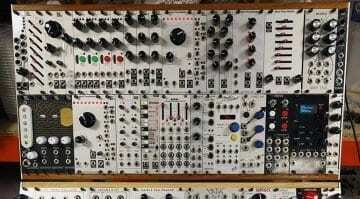 Make Noise modules are beautifully bonkers, while Erica Synths modules bring the darkness. Unfortunately, their stands were opposite one another at the top of the main flight of stairs and so were packed with people the whole time. Much as I would have liked to have a play with Make Noise’s weird Morphagene tape slicer thingy I just couldn’t get in there. But it was Erica Synths that brought the cool new stuff to Superbooth in the shape of a Black (of course) Dual VCF and a very engaging Drum Sequencer. The filter’s great, it’s got two identical circuits running in either serial or parallel and it has this awesome LED spectrometer displaying the filtered frequency content of the audio signal. The Drum Sequencer computer really was something else. Featuring this cool retro mechanical style keypad which acted as the 16 steps, but could also be drum pads, pattern selection, mutes and accents. There are 16 channels in this thing and 12 of them have an accent output as well as a gate output. It could run your whole show. I did get to have a poke on that and I can confirm it feels as great as it sounds. Bastl’s stand was in the main foyer of FEZ and open to the public all day. The other main areas of the show are open to press and trade only until 2pm when it then opens to the public. They were making a lot of noise, not helped by having an electronic drum kit in constant use, and were surrounded by enthusiastic activity. What they did have was cool desktop effects box inspired by old tape delay machines. It’s called Thyme and is a robot operated digital tape delay. It plays around in the spaces between regular time-based effects like reverb, chorus, delay, pitch and tremolo, but it does it with a digital bent. It lurches from hi-fidelity to bit stretching lo-fi, aliasing highs to crunchy lows. There are controls for all these things but it gets interesting when you bring in the modulation robots to take control. Add in a bunch of trigger buttons and a step-sequencer and you’ve got a very unusual effecting instrument to play with. Heading left-field into one of the start-up (or upstart!) modular makers I had a chat with Daniel Mulder of Livestock Electronics. He’s been building Eurorack modules for only about a year, starting off as part of his masters in music in exploring how to mod a Gameboy for Eurorack. He’s a chiptune enthusiast (poor fella) and his main interest lies in live performance. He’s currently planning to bring 5 modules to market. Shepard is a 4 channel 16 step sequencer into which you create sequence “loops” which you can then trigger in live performance. 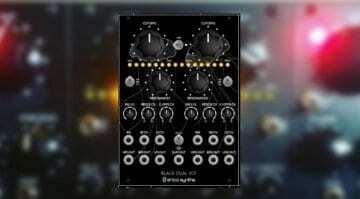 Bang is a lo-fi wavetable oscillator with which you can create and share your own wave libraries. Waves are divided into several chunks and then the odd and even knobs select two waves from within. The result is very arcade-like. Next, there’s Maze, a mixing and routing matrix for audio, CV or gate. The 4 inputs and outputs can be configured however you like with control over mix intensity. And then there’s two more utility modules, the MIR mixer/inverter/VCA with distortion and everyone’s first DIY project the Mult that he calls Felix. He’s got some great design ideas going on, I’m loving the green and spacey approach. It’s remarkable he’s come so far in such a short space of time but this can be the essence of modular and also what Superbooth is all about. I’m looking forward to seeing them on Modular Grid. 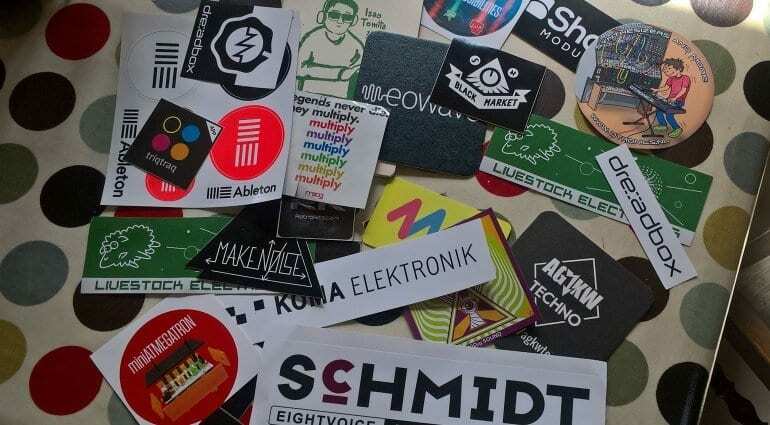 Zvex make a range of boutique guitar stomp boxes and became aware that a lot of people were using their effects with their modular systems. So, they’ve decided to branch out into modular versions of some of their effects. Part of their boutique charm that they have also brought to Eurorack is that they will hand paint the front panels for you. Theirs was certainly the most colourful rack at the show. Currently, they have two modules. The Fuzz Factory they describe as having all the same content as the pedal: “The self-oscillation, the gating, the gooey sticky velcro tearing fuzz, all of that strange wonderful interactive excitement has arrived in this incredibly controllable box of mayhem.” And the Instant Lo-Fi Junky which is a compressor and warped chorus effect. Even the standard paint job looks fabulous. Error Modular had a bit of a paradox going on. On the one hand, they were showing their Spikes human impaling module, where you run your hand over the 14 touchpoints to generate sound and manipulate voltage, creating largely just about controlled noise. 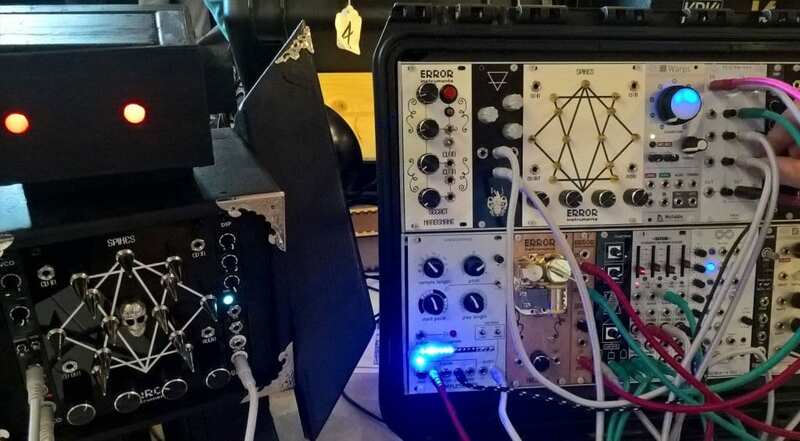 And then, on the other, they were also showing their Sonic Lullaby music-box module, which is a real live wind-up music box fused to a contact-microphoned Eurorack module. It produced a delightful sound which they were then sampling and twisting into another module like some sort of charming child’s nightmare. It was sublime. I can image the Sonic Lullaby and the Make Noise Morphagene getting on like a house on fire. Error Instruments – Sonic Lullaby on the bottom row with the wooden faceplate and Spikes is in the robot on the left – fab! Not many people covered it but Befaco had brought along an awesome Eurorack mixer solution. 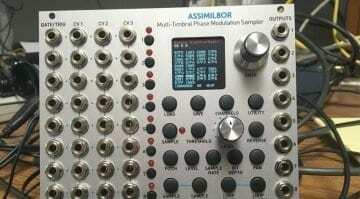 Most Eurorack mixers are very basic summing modules, or even the performance orientated ones have the simplest of controls. 3U is a tiny amount of space to fit a channel strip. Befaco were undeterred and decided that as most people performing with modular are going to have more than one row then, sod it, we’ll make a proper mixer and fit it vertically in two rows. This enables them to have the Hexmixer – a 6 channel mixer with a 3 band EQ at the bottom and the Hexpander with 3 aux sends and stereo returns and a headphone amp. You just don’t see proper EQ in a Eurorack. On the 6 channels the EQ was quite steep, acting a bit more like kill switches. The EQ on the master was more traditional. Another great feature was the vactrol based mute switches which gave a really soft and natural sounding mute action. They were also momentary switches so you could hold them down to let signal through – you could sort of play your channels. It’s an awesome thing. After many hours of wandering around the show I gave my feet and ears a rest in the fabulous auditorium. It was inbetween sets and blissfully quiet. The performance programme is quite intense and one of the best features of Superbooth. Sure, manufacturers get the opportunity to talk about and demo their gear to a larger audience in one go, but many of them let you sit back and simply enjoy them performing on this music technology that they’ve crafted. One such company was MFB who took to the stage, wired a few boxes together and started pumping out this extraordinary sound. I don’t fully understand what their gear is all about. There was a SonicState video interview with them from day 1 that I watched and I still don’t have a clue. However, I didn’t have to understand the technology to be thrilled by the performance. There was another venue outside that had a similar line up of artists and manufacturers. But there was also interviews, discussions and other activities threaded through. 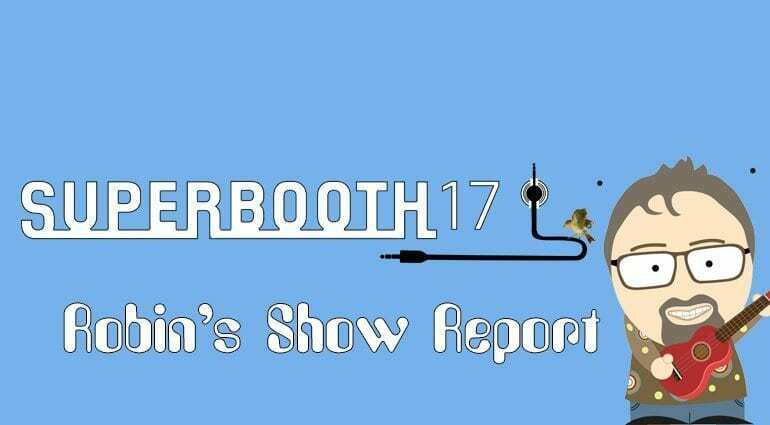 Other trade shows do have performances, but Superbooth goes all out in making it an important and engaging part of the event. There was so much good stuff to be had and great conversations to strike up with like-minded people. Yamaha seemed uniquely out of place with their huge workstation keyboards and pianos, but they did bring a cool technological installation of a reface keyboard being fingered by the many prongs of a robotic interface. Arturia had a very cool spaceship to play in but had nothing new except for black versions of the Beatstep controllers. Propellerheads and Bitwig were there talking about hardware integration. Ableton has Live controlling bits of lego. Actually, there was quite a bit of physical control going in a Koma Elektronik style. Avid were there demonstrating how Pro Tools can be the centre of your modular setup because all the Pro Tools HD interfaces are DC Coupled. PreSonus also unveiled a top end Thunderbolt interface with DC Coupled I/O – hopefully, this trend will filter down to less expensive interfaces. Kirkpatrick had a weird handheld music production device called Tungsten. ROLI was there with his Blocks and Zoom had their ARQ beat making ring thing that everyone ignored. There were cool controllers from Expressive E, Joué (still not ready yet), Haken Audio and Sound Machines. Jomox and Elektron had their new drum machines going and there were so many modules you couldn’t count them all. And there’s loads I haven’t mentioned. It’s like the best music shop ever! It’s just a shame you can’t buy anything. The intention of Superbooth is to be a better form of trade show. One that respects the need for business to occur while emphasising the community and culture of electronically made music and technology. 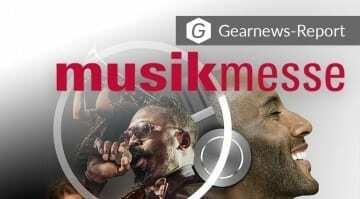 It wants to connect people and give them opportunities to experience new gear and new sounds in a creatively conducive environment. Does it pull it off? Yes, for the most part. The intensity of noise down the modular corridors is either heaven or sonic torture. The old trade show problem of not being able to “hear the gear”, something Superbooth hoped to avoid, is still very much in evidence – although not everywhere. I found the layout of the show quite confusing, the signage and direction to be poor. I managed to walk past some booths an awful lot and others hardly at all and also found myself places that had nothing to do with it. There was also very little in terms of internet wi-fi. It’s a missed opportunity because there are loads of interesting connections that could be made via online live-feeds, people tweeting and instagraming about what they’ve discovered – that whole side was slightly muted. There’s also a gender and probably a general diversity issue – which is not uncommon in music technology but was sharply obvious here. I’d say over 90% of attendees and nearly all of the exhibitors were white blokes in black t-shirts. There are plenty of women who use and perform with technology, they just weren’t represented in the inventing or making side of things – and that’s a shame. Is it something that can be tackled? Who knows, but overwhelming white maleness is not, in my opinion, completely healthy in any situation and all I can do is point it out. The general vibe, the feel of the place and the range of stuff to see and experience is excellent. I’ve been to many trade shows, NAMM, AES, Musikmesse and they are largely schmoozy industry jollys where you are all out on company expenses talking to the same sales reps you see in your day job. They are sales and marketing events. Superbooth isn’t that, well at least not quite so much. This is more about people sharing a passion and showing off technology that they’ve built and sweated over and contributing to an effervescent culture. You could notice the difference between talking to the demo guy employed by Arturia and the guy who was demonstrating the modules he had designed and made. And I don’t mean to do a disservice to the excellent people who represented the bigger brands – it’s just different. But I believe this kind of show does them a lot of good. Hopefully, it reinvigorates them, lets them think less corporately and connects them with the people who use their gear. Because of the wealth of stuff on offer it was hard to fit it into a single visit. I was too busy digging into the gear to really appreciate the many performances and potential workshops. It’s really more of a festival than a trade show and maybe it needs to embrace that and push into the whole weekend. Maybe even offer camping and overnight accommodation with events going late into the night. However, this was just year 2 and it’s still the most exciting, most passionate, open and collaborative music trade show on the planet. It’s electronic music, community and culture colluding in a few days of intense tech talk and music making. So, yeah, it’s pretty super and next year I’m going for the whole damn thing.